"The professionals who study the relationship between money and happiness are the psychologists. And three of them, Elizabeth Dunn, Daniel Gilbert and Timothy Wilson, of the universities of British Columbia, Harvard and Virginia respectively, have published, in the Journal of Consumer Psychology, a useful guide to their profession's finding on how to get more satisfaction from your spending." "Their final tip is another odd one: follow the herd instead of your head. Research suggests that the best way to predict how much we will enjoy an experience is not to evaluate its characteristics ourselves, but to see how much other people liked it." My own study of happiness — which was published on this site about 10 years ago and written nearly 30 year ago was designed for people like me: creative, inventive, on the look-out... It is based on the stylistic development of natural mechanics of active/reactive levers of aggressiveness and submissiveness. People who are creative (me!) are often on the cusp of depression, despair and distress. Creativity is highly demanding especially when avoiding the old pathways, the old styles and the laziness. This is why I invented positive anger then — turning "anger" into a positive creative force. Happiness is a dynamic complex emotion which derives from our acknowledgement of successful activities and reactivities. It is generated as we experience some accidental encounters, random events, sought-after results and cultural participation—all of which involve basic animal contentment. Although success at work and monetary gains can help generate happiness, it is usually the perceived quality of our attitude in our relationships, including the one with our self, which capitalise our successes into greater long-lasting happiness. For the human species, life has developed way beyond mere survival. We have generated many social identities, as groups and sub-groups, using many concepts and tools in which we believe, including languages, religions, cultural traditions, technologies, sciences, money, arts and many more. These are stylistic interpretations of life. It is through style rather than survival that we have modified natural reactivity into activity. Human stylistic interpretations are adaptive extensions of our complex memory in reaction to the environment. We make a stylistic choice when faced with several solutions presenting equal satisfactory result. This is why stylistic interpretations do differ between groups of people and also why they can conflict within one single group. In short our ability to make an active stylistic choice is the most important part of human evolution. Yet choices can be influenced by many reactive factors, some relevant some not. This why we have to learn how to make the best active choices, and recognise the value of some reactive choices in certain situations. Like our other stylistic interpretations, happiness is a strong stylistic enhanced emotion, towards sublimation, of animal contentment, which in itself is the resultant of successful survival. This is why, as humans, there are many ways in which we can discover, feel or express happiness. Not-surprisingly, many points of views about happiness have been expressed in contradictory, obscure and comparative manners... For example in some religious beliefs, while it is not a sin to be happy, pain and suffering are better rewarded, in a glorified after-life, than contentment. This has led to strange behaviours such as self-flagellation, auto-mutilation and martyrdom. Contrary to natural reactive balances of pain and pleasure, these beliefs encourage suffering, and distance us from care in our natural environment. Or some secreted island, Heavens knows where! The object of government in peace and in war is not the glory of rulers or of races, but in the happiness of the common man. Oh! How bitter a thing it is to look into happiness through another man's eyes. Indeed health and wealth provide two sound platforms for happiness, but acting life through reciprocated caring relationships — including the relationship with our self, appreciating the fact that we exist as we are—is the multiplying factor of happiness. We value our relationships with our self, our family, friends and partners more than anything else. We get hurt when these relationships falter for whatever reason. Made of flesh born of its environment, we react to it. For example, love and compassion can be magnified by physical contact such as touch, cuddles and embraces. The reciprocity of sexual experience greatly surpasses personal gratification, yet personal gratification is not unnatural. Ultimately our mind is the place where acceptance happens. A great part of creativity is acceptance, including acceptance of diversity, existing as well as un-expressed yet. A ‘soul partnership’ generates with minimum effort because the stylistic interpretations of respective partners are at similar level of understanding—in some cases, even with cultural differences—in genetically constructed compatible framework. The combination includes intelligence (our ability to capture stylistic interpretations of life) as well as smell, voice and appearances. In a word, we click. Any further relationship developments still need to be creatively managed. In the management of health, wealth and relationships, we are influenced by our genetic trends, our perceptions, our sense of discovery, the uncertainty of events such as accidents, other people's behaviour, our expectations, our habits, ultimately, our creative decisions—all part of, or relating to, our stylistic interpretations. In our childhood we learn basic stylistic interpretations in a mostly empirical dictatorial manner. Should we be depressed, now is the time to refocus or modify these interpretation through new tooling processes which include deliberate curiosity and tricks, which have made some of us more successful than others. Relatively wealthy, we care by eating the right food and by being active such as training at the gym (Walking is better, though)... We also enjoy great relationships. We are making the right decisions while being alert to dangers and valuing what we have and create. We are on top of the world. Some of us are not happy because we go through life like driving through fog. We have no clear understanding of what we have or who we are. We rely on habits to survive. We are lucky if we do not get hurt. We should realise that our stylistic interpretations of life are too weak to provide us with anything greater than basic contentment, but usually cultivate disenchantment. Some of us are somewhat happy while being ignorant. We don’t want to know. Knowledge can be painful if it is not well managed. Thus happiness is hemmed in by reality or destroyed by traumatic events. We need to know more by becoming creatively curious. Some of us have not cared much, considering the risks we take. We have not cared much about any one, except on our own terms—for ownership, for status or for sexual gratification. Power is gained by physical strength, deceit or tactical authority rather than by care. Love, trust and respect generate form caring reciprocity in relationship. In order to be caring, we do not have to abandon risk taking, nor do we have to wilt from the difficulties of competition, but we adapt and modify our attitudes to enjoy improved relationships. We need to be aware that stylistic interpretations of life inevitably contain illusions—self-delusions or socially engineered illusions—which make us react rather than act. Creatively, we do not have to perform at warp speed at all time to generate permanent happiness. Happiness happens and is maintained incrementally. There are times for maximum thrust in creation, yet there are times for rest, peace, reflection and recreation in order to avoid burn out and losing track of the multi-faceted reality. Earth is in the throes of a mass extinction event and climate change upheaval, risking a planetary shift into conditions that will be extremely challenging, if not catastrophic, for complex life (1). Although responsibility for the present trajectory is unevenly distributed, the overarching drivers are rapid increases in (i) human population, (ii) consumption of food, water, energy, and materials, and (iii) infrastructural incursions into the natural world. As the “trends of more” on all these fronts continue to swell, the ecological crisis is intensifying (2–4). Given that human expansionism is causing mass extinction of nonhuman life and threatening both ecological and societal stability, why is humanity not steering toward limiting and reversing its expansionism? The rational response to the present-day ecological emergency would be to pursue actions that will downscale the human factor and contract our presence in the realm of nature. Yet in mainstream institutional arenas, economic, demographic, and infrastructural growth are framed as inevitable, while technological and management solutions to adverse impacts are pursued single-mindedly. Although pursuing such solutions is important, it is also clear that reducing humanity's scale and scope in the ecosphere is the surest approach to arresting the extinction crisis, moderating climate change, decreasing pollution, and providing sorely needed leeway to tackle problems of poverty, food insecurity, and forced migration (5). The question that arises is why the approach of contracting the human enterprise tends to be ignored. The answer lies in the deeper cause of the ecological crisis: a pervasive worldview that imbues the trends of more with a cachet of inevitability and legitimacy. This worldview esteems the human as a distinguished entity that is superior to all other life forms and is entitled to use them and the places they live. The belief system of superiority and entitlement—or human supremacy—manifests in a range of anthropocentric commonplace assumptions, linguistic constructs, institutional regimes, and everyday actions of individual, group, nation-state, and corporate actors (6). For example, the human is invested with powers of life and death over all other beings and with the prerogative to control and manage all geographical space. The all-encompassing manifestation of the belief system of human supremacy is precisely what constitutes it as a worldview. This worldview is not necessarily an explicitly articulated narrative. Rather, it forms the tacit postulate from which people source meaning and justification to disregard virtually any limitation of action or way of life in the ecosphere and toward nonhumans. Human supremacy is the underlying big story that normalizes the trends of more, and the consequent displacements and exterminations of nonhumans—as well as of humans who oppose that worldview (7, 8). In this context, it is crucial to recognize that human supremacy is neither culturally nor individually universal, nor is it derived in any straightforward way from human nature. However, western civilization has elaborated its most forceful, long-standing expression, and through the West's ascendancy the influence of this worldview has spread across the globe (9). The planetwide sense of entitlement bequeathed by a supremacist worldview blinds the human collective to the wisdom of limitations in several ways, thereby hindering efforts to address the ecological crisis by downscaling the human enterprise and withdrawing it from large portions of land and sea. First, because the worldview demotes the nonhuman in favor of the human, it blocks the human mind from recognizing the intrinsic existence and value of nonhumans and their habitats. Nonhumans are rendered as resources and considered dispensable or killable; it is assumed that natural areas can be taken over and converted at will. In 1769, in Paris, a French philosopher Denis Diderot described how a new, luxurious red dressing gown made him miserable rather than happy. The cause of that unhappiness is still being examined by psychologists and marketing professionals some 250 years later. A film by Brendan Miller. In 1741 he also met Antoinette Champion, daughter of a linendraper, and in 1743 he married her—secretly, because of his father’s disapproval. The relationship was based on romantic love, but the marriage was not a happy one owing to incompatible interests. The bond held, however, partly through a common affection for their daughter, Angélique, sole survivor of three children, who was born in 1753 and whom Diderot eventually married to Albert de Vandeul, a man of some standing at Langres. Diderot lavished care over her education, and she eventually wrote a short account of his life and classified his manuscripts. In 1745 the publisher André Le Breton approached Diderot with a view to bringing out a French translation of Ephraim Chambers’ Cyclopaedia, after two other translators had withdrawn from the project. Diderot undertook the task with the distinguished mathematician Jean Le Rond d’Alembert as coeditor but soon profoundly changed the nature of the publication, broadening its scope and turning it into an important organ of radical and revolutionary opinion. He gathered around him a team of dedicated litterateurs, scientists, and even priests, many of whom, as yet unknown, were to make their mark in later life. All were fired with a common purpose: to further knowledge and, by so doing, strike a resounding blow against reactionary forces in church and state. As a dictionnaire raisonné (“rational dictionary”), the Encyclopédie was to bring out the essential principles and applications of every art and science. The underlying philosophy was rationalism and a qualified faith in the progress of the human mind. In 1749 Diderot published the Lettre sur les aveugles (An Essay on Blindness), remarkable for its proposal to teach the blind to read through the sense of touch, along lines that Louis Braille was to follow in the 19th century, and for the presentation of the first step in his evolutionary theory of survival by superior adaptation. This daring exposition of the doctrine of materialist atheism, with its emphasis on human dependence on sense impression, led to Diderot’s arrest and incarceration in the prison of Vincennes for three months. Diderot’s work on the Encyclopédie, however, was not interrupted for long, and in 1750 he outlined his program for it in a Prospectus, which d’Alembert expanded into the momentous Discours préliminaire (1751). The history of the Encyclopédie, from the publication of the first volume in 1751 to the distribution of the final volumes of plates in 1772, was checkered, but ultimate success was never in doubt. Diderot was undaunted by the government’s censorship of the work and by the criticism of conservatives and reactionaries. A critical moment occurred in 1758, on the publication of the seventh volume, when d’Alembert resigned on receiving warning of trouble and after reading Rousseau’s attack on his article “Genève.” Another serious blow came when the philosopher Helvétius’ book De l’esprit (“On the Mind”), said to be a summary of the Encyclopédie, was condemned to be burned by the Parlement of Paris, and the Encyclopédieitself was formally suppressed. Untempted by Voltaire’s offer to have the publication continued outside France, Diderot held on in Paris with great tenacity and published the Encyclopédie’s later volumes surreptitiously. He was deeply wounded, however, by the discovery in 1764 that Le Breton had secretly removed compromising material from the corrected proof sheets of about 10 folio volumes. The censored passages, though of considerable interest, would not have made an appreciable difference on the impact of the work. To the 17 volumes of text and 11 volumes of plates (1751–72), Diderot contributed innumerable articles partly original, partly derived from varied sources, especially on the history of philosophy (“Eclectisme” [“Eclecticism”]), social theory (“Droit naturel” [“Natural Law”]), aesthetics (“Beau” [“The Beautiful”]), and the crafts and industries of France. He was moreover an energetic general director and supervised the illustrations for 3,000 to 4,000 plates of exceptional quality, which are still prized by historians today. Philosophical and scientific works. While editing the Encyclopédie, Diderot managed to compose most of his own important works as well. In 1751 he published his Lettre sur les sourds et muets (“Letter on the Deaf and Dumb”), which studies the function of language and deals with points of aesthetics, and in 1754 he published the Pensées sur l’interprétation de la nature (“Thoughts on the Interpretation of Nature”), an influential short treatise on the new experimental methods in science. 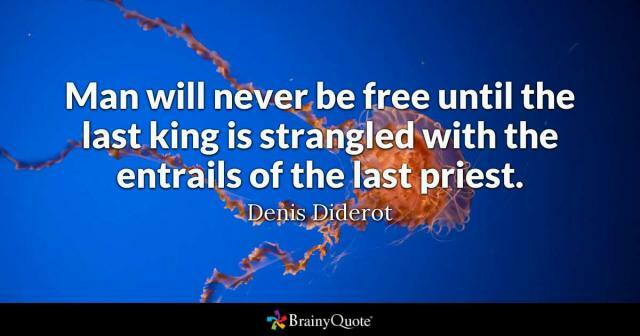 Diderot published few other works in his lifetime, however. His writings, in manuscript form, were known only to his friends and the privileged correspondents of the Correspondance littéraire, a sort of private newspaper edited by Baron Grimm that was circulated in manuscript form. The posthumous publication of these manuscripts, among which are several bold and original works in the sciences, philosophy, and literature, have made Diderot more highly appreciated in the 20th century than he was in France during his lifetime. Among his philosophical works, special mention may be made of L’Entretien entre d’Alembert et Diderot (written 1769, published 1830; “Conversation Between d’Alembert and Diderot”), Le Rêve de d’Alembert (written 1769, published 1830; “D’Alembert’s Dream”), and the Eléments de physiologie (1774–80). In these works Diderot developed his materialist philosophy and arrived at startling intuitive insights into biology and chemistry; in speculating on the origins of life without divine intervention, for instance, he foreshadowed the evolutionary theories of Charles Darwin and put forth a strikingly prophetic picture of the cellular structure of matter. Though Diderot’s speculations in the field of science are of great interest, it is the dialectical brilliance of their presentation that is exceptional. His ideas, often propounded in the form of paradox, and invariably in dialogue, stem from a sense of life’s ambiguities and a profound understanding of the complexities and contradictions inherent in human nature. Labour MP Liz McInnes, who did show up, accused the Conservative Party government of showing disdain towards the poor and said that the United States had shown similar disinterest when the UN highlighted poverty there. “I know that we have a special relationship with the United States, but I think it shames us all that we share that disdain,” McInnes said. Alston said that while the British government focuses on an impending exit from the European Union, it has treated poverty as an “afterthought” — an accusation which seems to be supported by the minimal attendance at Monday’s debate. There was no sign of Theresa May or even new Work and Pensions Secretary Amber Rudd, who sent a junior minister in her place. Faced with debt, compassion fatigue and social media attacks from angry pet owners, veterinarians are committing suicide at rates higher than the general population, often killing themselves with drugs meant for their patients. 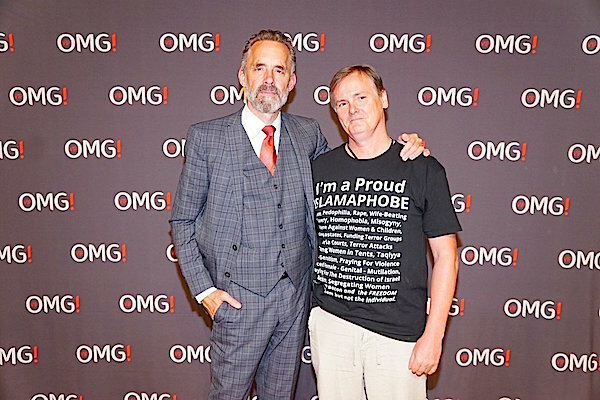 The Jordan Peterson Show has rolled into town with a bag full of nostrums about how to cope with life – stand up straight, clean your teeth, make your bed, don’t pinch the milk money et cetera. What he’s peddling could be a mixture of Dale Carnegie and Billy Graham with a sprinkle of Miss Piggy. A lot of it feels like wading through suet. He’s also a bit scratchy, getting into a huff with a young woman on Q&A who thought his ideas were “banal”. Naturally, there was the obligatory buttery interview with him in The Catholic Boys Daily. No doubt about it, the man is popular and that could be the problem. Popular remedies for complex problems. For instance, he gave a little lecture to the Q&Aaudience about individual identity and group identity. Hang about. Doesn’t this obscure the complexity of the human experience, that we’re all capable of several iterations, that humans are complex and fluid, within groups and as individuals, and that de facto we aren’t necessarily wedded to the acceptance of anything? Still, if you’re buying magic potions, complexity is not what you want to hear.